TORONTO, ON--(Marketwired - Dec 1, 2014) - With 2015 just around the corner, the travel experts at Cheapflights.ca, the online leader in finding and publishing travel deals, have dusted off their crystal ball and are once again forecasting travel trends for the upcoming year. In its Top Travel Trends and Hot Destinations for 2015 report, the team shares its take on the where and how of Canadian travel for 2015. From sports and wellness travel to the adoption of the latest travel tech gadgets and apps to the rise in 'airtiquette', Cheapflights.ca sees 2015 shaping up as a year of travel innovation and exploration for Canadians. And, to round out its predictions, the team has highlighted seven growing travel hot spots where Canadians will go in search of new adventure. "Each new year brings with it the opportunity to set goals and expand horizons," said Brittany Dietz, editor and travel expert at Cheapflights.ca. "2015 will be no exception as Canadians, true to their travel spirit, will pack their passions and use technology, savvy and even charm to maximize their experiences, regardless of budget. From Pacific paradises to Mediterranean and Caribbean hot spots and even the rugged beauty of Iceland and the Alps, we expect to see Canadians at the centre of the travel action." WEARABLE TECH AND LOCATION-BASED SERVICES FOR TRAVEL GOING MAINSTREAM - Airlines are increasingly using wearable tech to engage directly with their passengers and provide efficient, targeted service throughout the journey -- from check-in to baggage. Virgin Atlantic held trials with Google Glass and Sony Smartwatches. Japan Airlines has been ahead of the curve too, equipping staff with smartwatches. In 2015 we'll see a greater rollout of this -- in-flight as well as on the ground. For the travellers themselves, high-quality wearable cameras such as GoPro and Autographer will continue to fuel social media networks, meaning that every single step of a vacation is documented. On-the-go tech also translates to the ability to arrive in a city and find "just-in-time" deals on everything from tours to hotels to meals. This trend is increasing in popularity with budget-minded travellers who are not fixed on a particular hotel or plan and will trade predictability for affordability. GREATER SEGMENTATION/PERSONALIZATION ON FLIGHTS - 2015 is all about the "c" word -- choice, choice, choice. Be on the lookout for opportunities to personalize and upgrade your flight. Airlines will create special pods in their economy classes giving families and couples greater privacy -- if not oodles more legroom. JetBlue's new Mint class offers personal suites on flights between New York and both Los Angeles and San Francisco (with more routes coming) for prices far below traditional first class. More airlines will offer the sort of perks once reserved for First-Class flyers. We're also betting that hotels will strive to differentiate themselves against peer-to-peer lettings sites such as Airbnb with value-added services (concierges for example) and establish themselves as destinations in their own right. At the other end of the scale, sharing-economy accommodation sites will upscale and add features to compete with hotels. AIRTIQUETTE - With power-up rules at some airports, omnipresent mobile tech, the potential for hacked boarding passes, seat defenders wielded by assertive passengers, the predominance of the in-flight selfie (taken with the near-ubiquitous selfie stick) and carry-on meals that often pack an odour punch all creating flash points for passenger conflict, we are expecting "Airtiquette" to be a major issue in 2015. Airlines will be taking a zero-tolerance approach to air rage. Flight crews will be on the lookout for trouble and ready to bring in official help when they need it. However, to get ahead of issues, the airlines will get proactive, adapting the seats on their planes, creating alternate seating layouts, adding dual-level armrests and "smart" pockets to stow devices and charging "stations". CELEBRATING FOOD - Food has always been a part of both travel and celebrations but, increasingly, travel has become a way to celebrate food. 2015 is a landmark year in this regard as the idea of a formal restaurant turns 250. The birth place of dining was (where else?) Paris. The year was 1765. The restaurateur was Monsieur Boulanger. And the house specialty was soup. Fast forward to today and celebrity chefs, online reservations and reviews and a more mainstream "foodie" mentality have turned dining into entertainment at home and on vacation. Cooking (and even extreme eating) shows spotlight the cuisine of cities and cultures around the world, making everything from destination cooking classes to celebrity chefs tours (on land and on cruise ships) and a renewed emphasis from airlines on food and beverage ready to be front and centre in 2015. And where does Cheapflights predict Canadians will be travelling to in 2015? Rounding out our annual travel trends piece are the seven hot destinations predicted to be on the rise next year. They include Tortola, British Virgin Islands; Iceland; Bali; Malta; The Alps and Lithuania. To read more on these destination trends and to see the full details in our Top Travel Trends and Hot Destinations for 2015, visit www.cheapflights.ca/news/top-travel-trends-hot-destinations-2015. Momondo Group is an online travel media and technology company that is driven by the belief that an open world is a better world. The group now serves travel search and inspiration to over 17.5 million visitors a month -- plus 7 million travel newsletter subscribers -- via its Cheapflights (www.cheapflights.ca) and momondo (www.momondo.com) brands. Skygate began the sourcing of complex air-travel data in 1992, while Cheapflights pioneered the online comparison of flight deals for users in 1996 and momondo launched meta-search in the Nordic countries in 2006. The Group has offices in London, Copenhagen and Boston with a consumer base across more than 30 core international markets but users all over the world. 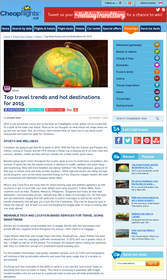 Blog post of Cheapflights.ca's Top Travel Trends and Hot Destinations for 2015. As the year is quickly wrapping up, Cheapflights gazes into its crystal ball to predict next year's hottest travel trends covering where, why and how Canadians travel.